Under the PE Act 2009, a Committee for Private Education (www.cpe.gov.sg) was set up in December 2009 to regulate the private education sector in Singapore and raise standards over time. From 21 December 2010, all private education institutions (PEIs) are required to be registered under a new Enhanced Registration Framework (ERF) and comply with the regulations under the Act in order to operate. A voluntary certification scheme, known as EduTrust, has also been introduced to help distinguish higher quality players in Singapore’s private education industry. SDH Institute (SDH) is registered with Committee for Private Education (CPE) under the Enhanced Registration Framework as well as certified under the EduTrust certification scheme. All EduTrust-certified private education institutions (PEIs) are required to adopt a Fee Protection Scheme (FPS) to protect all fees paid by all their students. All fees refer to all monies paid by the students to be enrolled in a private education institution, excluding the course application fee, agent commission fee (if applicable), miscellaneous fees (non-compulsory and non-standard fee paid only when necessary or where in applicable, for example, the re-exam fee or charges for credit card payment etc,) and GST. More details of the FPS can also be found in the FPS Instruction Manual, available at CPE’s website (www.cpe.gov.sg). Under the FPS, SDH has in place an insurance arrangement with Lonpac Insurance Bhd, a CPE-appointed insurance provider, to protect the course fees paid by ALL students. The FPS insurance serves to protect the student’s fees in the event that the PEI is unable to continue operations due to insolvency, and/or regulatory closure. In addition, the FPS protects the student if the PEI fails to pay penalties or return fees to the student arising from judgements made against it by the Singapore courts. The PEI shall purchase insurance to protect the course fees paid by each student within 7 working days from the date of receipt of fees. The insurance coverage shall commence from the fee payment date till the next payment due date or the course end date, whenever is earlier. Original COI will be emailed to the student’s email address provided. The School will print and give a copy of COI to the students. SDH provides medical insurance coverage for hospitalisation and related medical treatment for ALL full-time students for the entire course duration. SDH has put in place a medical insurance scheme provided by AXA Insurance Pte Ltd for all its students. SDH shall have a fair and reasonable refund policy for any payment made and maintain up-to-date and accurate refund records at all times. The refund policy is clearly communicated to all its students via the website, student contract, and student handbook. The refund policy must be clearly explained to all students and prospective students. The policy should also be available in students’ native languages where applicable. Students must also be communicated about the computation of the refund amount. b. The Student shall be informed in writing of alternative study arrangements (if any), and also be entitled to a refund of the entire Course Fees and Miscellaneous Fees already paid should the Student decide to withdraw, within seven (7) working days of the above notice. If the Student withdraws from the Course for any reason other than those stated in the above circumstances (i) to (vi), SDH shall, within seven (7) working days of receiving the Student’s written notice of withdrawal, refund to the Student an amount based on the below table. SDH shall provide the Student with a cooling-off period of seven (7) working days after the date of the Student Contract has been signed by both parties. The Student will be refunded the highest percentage stated in Schedule D of the Student Contract of the fees already paid if the Student submits a written notice of withdrawal to SDH Institute within the cooling-off period, regardless of whether the Student has started the course or not. 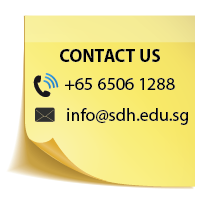 All students will enter into a standard CPE’s PEI-Student Contract with SDH during admission. Please click here to download a copy of the Standard PEI-Student Contract from the Committee for Private Education (CPE) website.